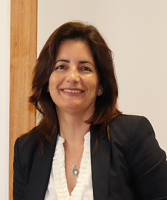 Cecília Calado has a PhD and an MSc in Biotechnology, and an Honorous degree in Biochemistry. She is a professor at the Lisbon High Engineering Institute (ISEL- Institute Superior de Engenharia de Lisboa), were coordinates the BSc and MSc in Biomedical Engineering and the R&D Lab. in Medical Bio-Engineering. She presents a broad experience in R&D in Development of Platforms to Discover Drugs and Diseases Biomarkers and Bioprocess Monitoring. She is a member of the IEEE-EMB, of the European Federation of Biotechnology, for Pharma and Medical Biotechnology and for Biochemical Engineering Science. Simultaneously to these multiple projects, has promoted various activities to enhance public awareness to Science, such as Presentations on Patents and Technology Transfer.